United Way of Wilkes officially launches NC 2-1-1 in Wilkes County. On August 16, 2018 United Way of Wilkes County held a reception to officially launch NC 2-1-1 for Wilkes County. Guest speaker for the reception was Congresswoman Virginia Foxx. 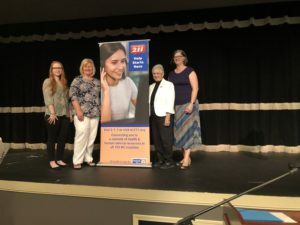 Other speakers were Amanda Perry, the United Way of Wilkes Board Chair, Heather Black, NC 2-1-1 presentative from United Way of North Carolina in Raleigh and Heather Murphy from The Health Foundation. Clara Hickman, Executive Director of United Way of Wilkes stated that they were so pleased to be able to offer this service to our community. Residents in Wilkes now just need to dial 2-1-1 to be able to get information and referral services for things such as food assistance, utility assistance, housing and shelter and healthcare assistance. The NC 2-1-1 is a free confidential informational and referral service. It is available 24/7/365. You will reach a live, trained call specialist and It is available in most languages. NC 2-1-1 is also a member of the State Emergency Response Team. Residents can call 2-1-1 to learn about important disaster related resources such as evacuations, shelter locations, food and water distributions and more in case of an emergency situation in Wilkes County. For more information please contact United Way of Wilkes County at 336-651-7800 or email us at chickman@uwwilkes.org.